A rainbow of colors provides a variety of nutrients in this flavorful vegan dish. In a large Dutch oven, heat oil over medium heat. Sauté onions for 3 to 4 minutes or until softened. Add garlic, curry powder, cinnamon, turmeric and cayenne; sauté for 1 minute or until spices are fragrant. Add broth and deglaze the pan, scraping up any brown bits. Add eggplant, sweet potatoes, carrots, yellow peppers and red peppers; sauté for 5 minutes. If vegetables begin to stick to the pan, add more broth. Stir in chickpeas, zucchini, raisins and orange juice; bring to a boil. Reduce heat to low, cover and simmer for about 20 minutes or until sweet potatoes are fork-tender. Stir in spinach, cover and simmer for 5 minutes or until heated through. Meanwhile, place couscous in a large, shallow bowl. Stir in boiling water. Cover and let stand for 5 minutes or until liquid is absorbed. Fluff with a fork. 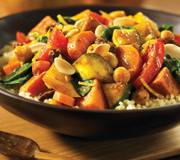 Spoon vegetable mixture over couscous and garnish with almonds, lemon zest and lemon juice. Chop all the vegetables (except the eggplant) the night before you make this dish to make prep time easier. Store chopped vegetables in the refrigerator. Replace the chickpeas with black beans or kidney beans. Use green bell peppers instead of red or yellow.